The SanSep provides a much more efficient level of solids removal than other mechanical and static screening devices that are typically used in wet weather excess sanitary flow treatment. Utilizing patented PWTech® technology, the SanSep allows screening of the solids without blocking. 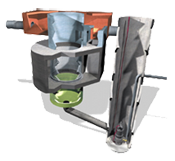 It greatly reduces the impact of excess wet weather sanitary flows by removing all visible solids and associated pollutants and returning them directly to the sewer. Download our product flyer for more details. Excess flow from the sewer enters the SanSep. Using patented continuous deflective separation fine-screening technology, all gross solids larger than 1 mm and finer sediments down to below 0.1 mm are captured and retained inside the unit. The settleable solid pollutants settle into the lower catchment chamber (sump), while the "floatables" are retained at the surface of the upper chamber (separation chamber). The innovative continuous deflective separation technology allows screening of the solids without blocking. A strong flow of fluid is maintained across the face of the screen, producing a "washing" effect that keeps solids moving while the fluid passes through the screen. The SanSep is typically automated with an underflow pump, which periodically removes the solids and returns them to the interceptor sewer, downstream of the overflow point. A process logic controller with a level sensor within the unit controls this entire process and returns the unit to standby condition between wet-weather sanitary flow events. Thus, operator attendance at sites is not required. A single unit treats flows ranging from 0.3 to 40 cfs, while multiple units can be used for even larger flows. Typical loading rates across the whole unit are 150 gpm/ft². With its non-blocking screen, the SanSep operates continuously at its maximum design flow. Copyright © 2008, 2011. Process Wastewater Technologies LLC. All rights reserved.